About the Children's Department: Resource for Grandparents & Parents In Your Church . . .
Resource for Grandparents & Parents In Your Church . . .
Over the past several years I have taken time to write about how Grandparenting Ministry strengthens Children's Ministry. When grandparents are focused upon passing their faith to their children's children, this benefits children, families and your ministry. So, it makes great sense for you to support and encourage grandparents. One way you can do this is to recommend resources for them to use to better understand how to pass their faith to their grandchildren and to use with their grandchildren. Today I'm very happy to recommend to you one such resource . . . Deeper In 4 Grandparents & Parent's, Too! Praying the Scriptures for the Children You Love - Psalms Edition. 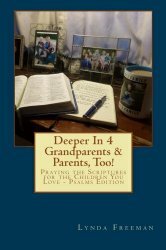 This book provides grandparents - and parents - with 52 weeks of prayers from Psalms which they will be able to pray for themselves and for the children they love. Each week provides a Scripture passage from the Book of Psalms, questions to help you think through what this passage is saying and then a personalized prayer for you to pray for your own walk with God and another for you to pray for your grandchildren. Then, the prayers are broken into seven portions - one for each day of the week. This helps you to pray focused on smaller portions so you are able to be very specific in your prayers throughout the week.